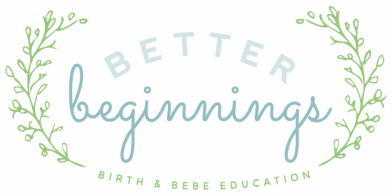 ​Better Beginnings aims to provide comprehensive prepared childbirth class. If you have never attended a childbirth class or perhaps just the short one at the hospital, you probably have quite a few questions. Let's see if we can answer some here. If you have any other questions, feel free to contact us. What happens in the class? We promise to keep each class informative, enjoyable, and relevant. Each evening includes videos, discussion, relaxation, and laughing. Each class is tailored to meet the specific needs of the attendees. After you register, I will contact you to learn more about what if really important to you. Every person that has attended my classes since opening in 2012 have been overwhelmingly satisfied. I want to make sure you feel the same. Who attends the classes? We encourage the expecting mom to attend all of the classes with anyone who plans to support you in labor. This may be your husband, mother, sister and/or friend. If you do not plan to have anyone with you at your baby's birth, that is fine. You can attend the class without a partner..
Our classes usually have 2 to 5 couples from a variety of backgrounds. Some are expecting their first, others already have children. Some of our clients are planning a VBAC (vaginal birth after cesarean), a natural birth, or have a medical condition that makes their pregnancy higher risk than average. All of our clients share common desires—to better understand labor, birth and baby and be prepared for the many decision that await them. Our clients not infrequently travel quite some distance to attend our class. If this class is a good fit for you, it is worth the drive from Mobile, Hattiesburg, or Slidell. Many of my past clients have repeated the classes in subsequent pregnancies to "get their head in the game" and focus on their new arrival. People find that it is extremely helpful to dedicate time to prepare. What does the class include? Depending on which classes you register for you will receive printed materials specifically designed for the class. Additionally, you will have access to our comprehensive library with books on a variety of topics, including: fertility, pregnancy, birth, breastfeeding, & parenting. As a client, you are welcome to contact us with questions or concerns throughout your pregnancy. I'm still not sure if this class is for me? There are a couple of things we can offer to help. We would love to meet with you in person for a free consultation. When we meet, we are happy to answer any questions you may have and hope you have that “good fit” feeling. If not, no hard feelings—really. We offer these services to benefit our larger community and want you to get the most out of it. Also, if you attend the first class and feel that it is just not what you are looking for, you can cancel and we will refund your money, minus the cost of materials. (We can only offer this for multiple classes registrations and You must notify us that you want to cancel within 24 hours of the first class). I really want to attend the class, but my husband is not as interested. It is normal for you to be soaking up everything baby-related you can get your hands on—good, bad, and otherwise. You are, after all, constantly reminded of the life growing within your tummy with all of the kicks and wiggles. Most husbands are not too excited about going to class, and some downright don't want to go. We understand. However, if he plans to be with you in labor and birth, he needs to prepare almost as much as you do. He at least needs to know enough to be calm and supportive, both physically and emotionally. You will need your “rock.” As we said earlier, we keep the class fun. We won't put anyone on the spot or ask anyone to do something they don't feel comfortable with. We have had excellent feedback from the daddies that have attended our class. Watching the love of their life, in labor can be scary for dad. We don't try and turn him into a doula, but we do work to eliminate the fear and validate his need to protect you in constructive ways. Our class prepares him, so that he knows what to realistically expect and can best support you. What if I Can't Afford Your Services? We firmly believe that preparing for the birth of your child by building knowledge, practicing skills, and developing a plan is critical to a happy, healthy, and empowered birth. We believe that not only are our services priced fairly, but are a fantastic value. I took a peek over at the Babies R Us website and the average price of the top selling strollers is over $200. If having knowledge and support are truly important to you and your budget doesn’t allow for the expense, we have some ideas to help. Gift Registry: This class is more important than half the things on your gift registry. Add us to your registry. Here is a cool app that lets you register at your favorite stores, merge the registries online, and add things like our classes and doula services. Payment Plan: Talk to us about a payment plan, we can most likely work something out based on your specific situation. Bartering: If you have a service or product we could use, we may be open to exchanging. Scholarship: We offer a limited number of discounts each year. We may be able to reduce the price of the class if you are truly in need. To apply for a scholarship, please send an email including the following information: What class or services you would like to have, the amount you are able to pay, an explanation of your current financial situation, and any circumstances that make our services important to you (for example, husband deployed, teen mother, etc). ​What Training Do You Have? Doula, Childbirth Assistant, Childbirth Education and Breastfeeding Support for the Mississippi Gulf Coast.